You only need to go into your local supermarket to see that demand for iced coffee is on the rise. The number of products on the shelves has ballooned and this is a trend that's taking hold from Amarillo to Zaragoza. In terms of actual volumes, iced coffees still make up barely 1% of the market but you can be assured that the segment will enjoy growth well into the future. That growth can partly be attributed to the rise of the coffee shop, which has been one of the retail revolutions of our generation. The emergence of iced coffee has piggy-backed this trend. Of course, there are many other outlets that offer connected products, like the brilliant start-up Jimmy's or dairies with their coffee-flavoured milk products. But, it's the coffee shop chains that have exposed many consumers to iced coffee and raised the category's profile. Visionaries at Starbucks and PepsiCo were the first to identify the opportunities that existed in harnessing the popularity of coffee shops and the potential for iced coffees. The pair first came together in the mid-90s through the North American Coffee Partnership (NACP). The agreement capitalised on the Starbucks name and utilised PepsiCo's distribution muscle to market and sell cold ready-to-drink iced coffee products under the former's brand name. The collaboration yielded considerable dividends, leading to a similar agreement being signed in Europe with Arla in 2010. Starbucks iced coffee proved an instant hit, triggering an acceleration in the presence and visibility of the segment in all channels. There were even supply issues in Norway! The partnership has recorded a 40% rise in sales every year since and, last year, the agreement with Arla was extended to include the Middle East and Asia. The deal will last for 21 years - Starbucks iced coffee success is clearly not a 'flash in the pan'. A steady flow of innovation has demonstrated the versatility of the Starbucks iced coffee brand and kept it fresh and interesting to consumers. Indeed, the range has helped to make iced coffee fashionable. It was no surprise then that the Coca-Cola Co has been quick out of the traps with a Costa RTD iced coffee - the purchase of Costa Coffee only went through in January. The new Costa iced coffee will be released sometime in the coming months, and we can expect it to be very well-supported - not just in Costa's home market of the UK. Coca-Cola may have missed the boat with Starbucks, but the group will have a blueprint to follow in converting a successful retail brand from the high street into an RTD product for the off-premise. The company initially joined forces with Dunkin' Donuts in 2017, to produce branded iced coffee beverages to sell in grocery, convenience stores. This was followed in late-2017 by teaming up with McDonald's to produce and market McCafé Frappes. Coca-Cola has shown that it can be every bit as pioneering as Starbucks in terms of NPD in iced coffees: Anybody who has tried the Dunkin' Donuts Pumpkin Spice Iced Coffee, launched in the US last October, will testify to that. The company has also gained experience with its Gold Peak Cold Brew Coffee since the start of 2017. Iced coffee is clearly very much a part of Coca-Cola's 'category cluster model' to help make the company a 'total beverage' company, thereby limiting its exposure to a mature CSD market. 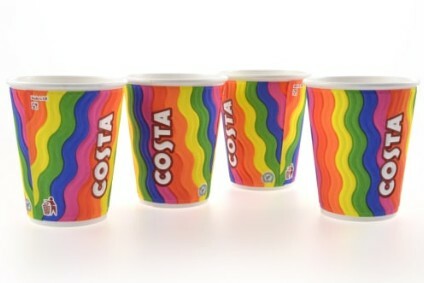 As such, we can expect to see Costa RTD coffee to feature in a number of International markets. China is an important part of Costa's future aspirations and there are plans to have 1,200 sites opened by 2022. That should give the launch of an iced coffee some momentum in the country, even if Costa will be dwarfed by the 6,000 Starbucks outlets that are planned. Starbucks has already signed up with leading food and beverage player Tingyi in 2015 to sell its RTD iced coffees out of their coffee shops. The vending channel is fast developing in China and that could be one way to progress quickly in such an attractive market. It was interesting to hear how much promise Coca-Cola sees in the prospect of combining Costa's vending machines with Freestyle dispensers to provide an all-round service of hot and cold. This would be relevant to all markets that Costa competes in. and vending is clearly viewed as a very viable future mechanism for growth. Coca-Cola will need to explore a number of these new avenues to build up the brand because Starbucks will prove a very tough adversary. There will be much at stake, as Coca-Cola looks to raise its interest in a high-margin, high-growth segment like iced coffee.